I’ve written before in support of Pell grants—federal assistance for college tuition targeted at students from low-income families. Barriers to college entry and completion have gotten steeper in recent years, as family incomes have lagged far behind tuition increases. Think of Pell grants as a ladder to climb over those steeper barriers. And for what? So millionaires can get a tax cut of almost $400,000, if you include both the new Ryan and the extended Bush tax cuts. A few weeks ago I promoted a model of the current political economy wherein income inequality does not simply divert growth from the poor and middle class. If inequality gets high enough, it supports (buys?) a politics that reinforces itself. What better way to do so than to block the educational mobility of the poor and use the proceeds to enhance the rich? If it wasn’t so freakin’ tragic, it’d be laughably simple. There’s another—a more global—dimension to all this. According to this OECD analysis, the US has essentially ceased making progress in terms of college attainment. The figure is a touch gnarly, but the blue (?—I’m color blind!) boxes show the tertiary, or college-level, attainment of 55-64 year olds in 2009, so people born between the mid-40s and the 50s. The light blue (??) triangles show the college attainment of the current generation of 25-34 year olds, so people born in the mid-70s through the mid-80s. This enables you to evaluate the progress made over a generation in college attainment across countries (let’s pause for some props to the OECD—they kill on this stuff). Not only are the US attain levels now behind those of 12 other countries, but we’ve made no progress in a generation. Politicians love to jawbone about how important education is to our future competitiveness, and to their credit, the Obama administration—members of whom are very much moved by that OECD graph—presided over a significant improvement in Pell grants. But for many in the political class, it’s just talk—or, as the new House budget shows, even worse than talk. It’s hypocrisy. I spend the hours of my working life on the intersection of economics and public policy, but when I look at this evidence and read about this and similar developments across the country, I’m left with one simple question. Share the post "What Are We Doing?" 30 comments in reply to "What Are We Doing?" This election will be much more than contrasting parties. This is about what we are as people. Will a majority of us reject the destruction of any kind of social contract? Will a majority of us reject a GOP that now represents all that is ugly in human behavior? Hopefully, the Obama campaign will take the time and effort to reteach social ethics while it works hard to keep the White House. We have much more at stake than appears on the surface. You’re implying that just because the GOP is bad, Obama is good. Or that Obama didn’t cut Pell grants in his budget. We are doing what our oligarchs tell us to do and will continue to do so until we get the money out of politics and fix our political representation problems. The longer it takes to recognize and fix this, the more pain that will accrue to those that lack power and representation. I’ve started wondering if the long term view of our economy in some political circles does not require an educated population. We wouldn’t be where we are today if our population was sufficiently educated. What is “sufficiently educated”? I know a lot of well educated people who have been seduced by right wing propaganda and vote against their best interests. We debate education for jobs, not education for democracy, the reason public schools were created. I bet most Americans would fail the citizenship test. We have no national goals or tests for civics, history, etc. Nazi Germany and the USSR had citizens well educated in math and science – clearly that type of education is not enough to support a healthy democracy. We should be having a national discussion about how ignorance (not stupidity) is seriously threatening our democracy and what kinds of knowledge and thinking skills are necessary to promote it. Forgot to say that math and science literacy are also important for responsible citizenship. We vote on “facts” supported by phony statistical manipulation, bogus science, etc. We do not need an in depth knowledge of these things, but an understanding of the basic concepts is crucial. One important obligation of citizenry is jury duty. Now that a lot of evidence is based on forensic science we need jurors who have a basic grasp of the concepts not only of things like DNA. It is also important to have the communication skills necessary to be able to participate in a meaningful way in political debate. We need to be able to detect bogus arugments as well as to express our points of view clearly. The ability to find the information needed to back up a position is also critical. For example the ability to read a blog like this requires the kind of background knowledge and skills I am talking about. You do not need a degree in economics, but you do need to understand basic economic theory and be able to read and interpret graphs, stats, etc. To join the debate you need to have the ability to express yourself in writing. This does not require a college degree. Both my kids learned enough to do this kind of thing in high school (public). Luckily they got out before the testing craze started. There was a nice chart I saw recently about … found it. The original graph is, of course, more informative, especially the fact that it includes loans. But before concluding that “more education[al subsidies]” in the face of rising tuition costs is the key, it helps to consider that many people with a college degree already can’t find work in their field. I saw another article, which included a prediction by some US government department that something like 30% of jobs created by 2018 would require a college degree, while another 35% or so would require technical certification. The remaining ~35% of jobs are expected to not require a college degree. So, what we are doing is avoiding subsidizing inflated tuition costs charged by providers of higher education. The solution to unemployment is, as usual, to reduce the total supply of work. To answer your rhetorical question, we appear to be eating our seed corn. For the answer to “why,” see perplexed above. A Single Hedge-Fund Hustler Makes More Than 85,000 Teachers: Why Are Our Priorities So Messed Up? Health care costs in the USA are twice those of other rich countries. Makes you wonder about higher ed costs too. Room board and tuition in a fine state school (VPI&SU) was last year 250% higher now than when my daughter graduated in 1999. There must be a better way to make college affordable than to have taxpayers providing more $$ for Pell Grants and thus “condoning” excesses. And yet not all the countries that have made little to no progress are “backwards.” What, for instance, explains the position of Germany in the chart? My suspicion is that there are cross-national differences in the educational system such that “pre-tertiary” education in some countries adequately prepares the students to perform well in a modern economy. Although such an observation doesn’t invalidate Bernstein’s entire point, doesn’t the German situation argue as well for a better “pre-tertiary” system, as well as providing opportunities to attend college? Or possibly because 30 years ago Germany was still 2 seperate contries that we are seeing an artifact of re-unification. @Flex: good point about Germany reunification, but can reunification account for both Germany’s below average eduction levels AND for Germany’s lack of improved education level between age cohorts? Phillip’s original comments still stand — how come Germany’s education level (and level of improved education) do not correlate with Germany’s level of economic success. Germany is a world economic leader, with a great prognosis for the future in spite of a “low” level of post-secondary education and no intergenerational improvement in these levels. Why is Germany different? Or better yet, perhaps post-secondary education is not the key to economic success?? Germany has a vibrant industrial sector in its economy. Machinists and assemblers can make good money and support their families – and they’re respected for their work and their ability. American businesses, in their greed for ever-reduced costs – has off-shored its manufacturing sector, creating massive unemployment and underemployment as these workers scramble for low-paying “Wouldja-like-fries-with-that” jobs. Germany has a balanced economy with room for all. 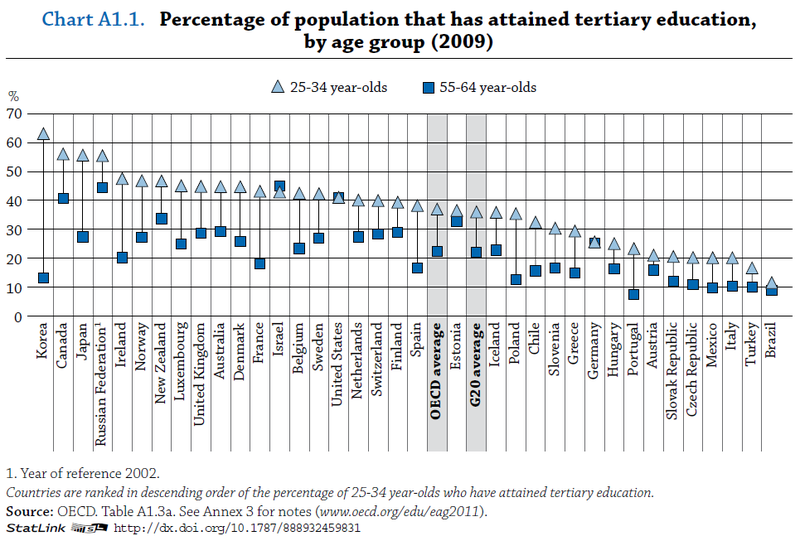 Not everybody wants or needs tertiary education – as a life-long educator, I point out this obvious fact to you. Even if Peter can’t do math, fails science and doesn’t know a gerund from an infinitive, he may still have a lot of potential as a machinist or a tool and die maker – and those are highly skilled trades which have to be respected. These people are suffering greatly. And they’re getting pinched in Germany now, too, though there’s still hope there for them. Germany’s economy has been balanced and has not needed to push huge numbers of students into university studies. Its statistics do not indicate a lack of progress, but rather a sustainable model. When I was newly divorced, and trying desperately to get some training that would land me a job that paid enough to support three children (because the ex was working under the table(on purpose), and I could not get him to pay child support…) I went to pay my tuition at Pasadena City College(CA). I had my checkbook out, wondering what we would be eating for the next couple of weeks, when the person checking my records said “you don’t have to pay this semester.” I was like, Whaaa..? She explained that in filling out the unending forms to register for classes, I had actually applied for govt funding, and my Pell grant had come through. I started crying right there, gobsmacked that I got some *help* from someone. Of course what the chart actually says is that the US and Israel were way ahead of the rest of the world 30 years ago in the percent of people going to college , (they are the 50-60 year olds today) and the rest of the world has caught up. I note also that Germany must be a disaster from your point of view. Not only have they not ‘improved’, they are still terribly behind the US and Israel and most of the rest of the world. Their educational model has obviously destroyed their economy. This is a vastly more complicated issue than you seem to imagine. In fact, there are very reasonable people who argue that we should emulate the German model and send more people to ‘vocational’ schools than colleges. While i completely agree that cost is an issue, the even bigger problem is the myth, unfortunately believed by most people, that any type of liberal arts degree has real economic value. We have done a gross disservice to the legions of communications, sociology, psychology, English art history etc. majors who now believe that their BA degree entitles them to a high paying job. That is at least as important a problem as the cost issue, but does not fit as neatly into a class warfare paradigm. Exactly! There’s more in this graph than just JB’s conclusions (which aren’t invalidated). As my old Data Analysis prof said, “You have to live with the data.” I’d like to hear some more discussion on Israel, the U.S., and Germany. Yes, it is quite complicated isn’t it? In addition to the “very reasonable” people that believe that the sole purpose of education should be to “optimize” the productive inputs (students) for the highest amount of value added in the economy there are also “very reasonable people” who believe that “trickle down” is a viable social and economic policy and that the lack of ability to establish and protect monopoly profits like the “high value” people can is a reliable indicator of “real economic value.” Just a guess, but I would suspect there’s a great amount of overlap in these “very reasonable people” groups and a very strong correlation between them and the lack of good, rigorous liberal arts education. A population highly educated in the liberal arts probably isn’t of great value to our oligarchs so that’s what should drive our education funding decisions right? Oh, wait, it already is now isn’t it. Ditto, bro. Why can’t we have both good vocational schools AND good liberal arts schools? Or why can’t students get a little of the other, in whatever “brand” of school they attend? Let’s not forget that our Founding Fathers, the be-all and end-all of Tea Party libertarian types, ranked each other educationally according to how well … they had mastered the Greek and Latin classics. Such works had nothing to do, of course, with what went into, I don’t know, the U.S. Constitution. That’s simply not true. The Constitution was deeply influenced by ideas from the Latin and Greek classics. The Federalist Papers as well. Amazing that Brazil is aparently racing ahead inthe world economy and yet the last in education.I beleive that the bigest chalenge in modern society will be to eduate our people on social morals and social justice. I.e. suppose we look at a batch of 55-64 year olds today. Suppose that 30 years ago half of them got a degree and half didn’t. That’s a graduation rate of 50%. But if in 2009 half of the people in this same cohort who did not get degrees 30 years ago go back to school and graduate, the graduation rate for this particular 55-64 year old cohort would be 75% today. Hence the data would show a graduation rate for 55-64 year olds of 75%, when in fact it was 50% 30 years ago. If this is what’s happening then things aren’t as terrible as they seem- it just means we are pretty good at getting older folks back to school. Also, maybe we should make some adjustments for quality? I don’t think comparing raw graduation rates has a complete meaning because I am not sure that the college wage premium is as high for a degree from, say, a Russian university as it may be for a degree from Harvard (not putting down Russia, just illustrating a point). How do we address this? Maybe we should compare total/aggregate wage premiums across countries? Two independent cohorts, which is how I think you’d want to do this to get a sense of progress in college attainment over time.